As suggested last week, this was amenable to a R resolution by low-tech simulated annealing although the number of configurations was not that large when accounting for symmetries. The R code is a wee bit long for full reproduction here but it works on moving away from a random filling of this cross by 0’s and 1’s, toward minimising or maximising the number of P’s, this simulated annealing loop being inserted in another loop recording the minimal number of 1’s in both cases. 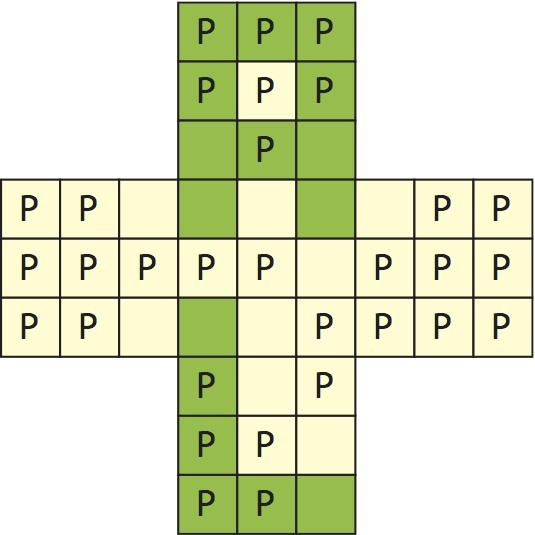 A first round produced 1 and 44 for the minimal and maximal numbers of P’s, respectively, associated with at least 16 and 3 1’s, respectively, but a longer run exhibited 45 for 6 1’s crossing one of the diagonals of the X, made of two aligned diagonals of the outer 3×3 tables. (This was confirmed by both Amic and Robin in Dauphine!) The next puzzle is on! To leave a comment for the author, please follow the link and comment on their blog: R – Xi’an’s Og.